In 2007 Toby Whithouse made a pilot for a show called Being Human. I saw the premise and I thought I would give it a whirl, if nothing else it seemed original. I immediately fell in love. The story was interesting, the characters exciting and warm, I wanted more instantly. I watched that pilot 7 times, showing it to friends, loving it more every single time, desperate for it to be picked up. In the pilot, Guy Flanagan played vampire Mitchell and Andrea Riseborough played Annie the ghost. 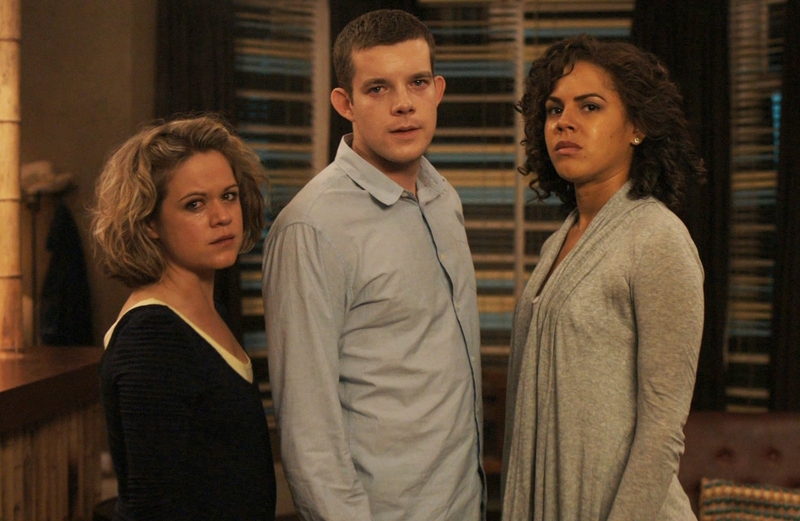 George the werewolf was played by Russell Tovey, the only cast member from the original pilot to be cast in the show when it was picked up. Guy and Andrea were my Mitchell and Annie, and when I found out that along with Adrian Lester who was playing Herrick, they were re-cast, I was completely devastated. Guy brought an otherworldly quality to Mitchell that I couldn’t see being replicated, an ‘oldness’ and romance associated with vampires. I believe this style was reintroduced later in the series for the character of Hal, which gave me some of what I had missed of Guy’s Mitchell. Andrea as Annie was vulnerable, but ballsy and hard, and I liked that about her, I liked the dry humour and the endless tea not being a nice ritual, but just a thing she did. And the way she and Guy’s Mitchell talked about the men with sticks and rope was so eerie. I always felt that there was more to that story as a result, and while it was mentioned in the future, I don’t think it ever gave me answers. Needless to say, I dug my heels in when the show came out. I would wait until the season was all out and watch it. Maybe I wouldn’t watch it. I needed time to grieve. When I eventually begrudgingly did watch the series, I did it because I still wanted to know, which is the hallmark of good story telling. I also adored Russell Tovey as George and thought he could get me though. I gave up after two episodes. It wasn’t enough. I was still grieving over my Annie and Mitchell. Who were these new people? What the hell were they doing to the characters I loved? It took re-watching and calming down later for me to get into it, and once I had let go and could see the show as it was, and it was fantastic. 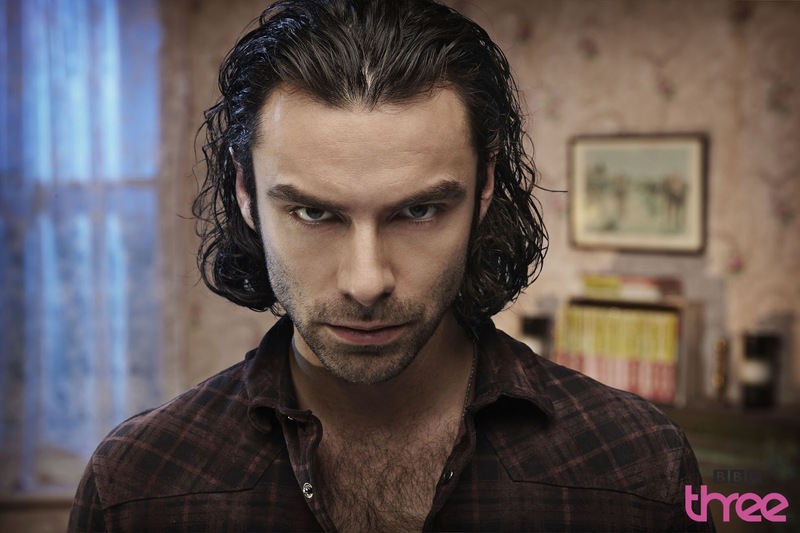 Aiden Turner’s Mitchell was different, he wasn’t poetic or romantic in the traditional sense of vampires, he wasn’t even strikingly good looking, he was able to blend in and he was also able to be enticing, which made him terrifying. One minute Aiden’s Mitchell was meek, hidden in the shadows, the next he was burning with charm, luring someone into his clutches. He gave a 21st century feel to the vampire that wasn’t full of mystery and longing, it was dangerous, he was a monster, and yet, he was trying to be human. I mean look at him! Especially when compared to the way they cast and framed his character in the US version! Lenora Crichlow’s Annie initially irritated me with all of her crying and her annoying habits, but later on, this became endearing, she became comic relief in darker moments, but also, she was able to humanise the show, humour is after all a way we deal with things that make us uncomfortable. Throughout season one all three main characters are presented as supernaturals who are trying to live in human society and hang on to that shred of humanity that they still have left. They often try to answer the question about what being human really means. Mitchell’s vampirism is presented as an addiction, and many of his stories read as an addict trying to get clean and the dark places the drug takes him, the way it corrupts him. He is not incapable of compassion or love however, is that enough to make him human? Annie suffers the affliction of someone who is not seen, who thinks that therefore what she does cannot matter and is also desperately lonely. How does companionship help us become more human? Is it important if people see us, and can we control that? George tries to separate the wolf inside him from himself, is ashamed of it and disowns it. He tries to control it in an attempt to be more human (and often werewolves are described in the show as being closer to human as they only change at the full moon) but ultimately, disowning any part of ones self is actually removing us from human attributes and making us less able to deal with our situation. It’s all deep stuff, but it doesn’t have to be read into. Being Human is also just about friendship and laughs in with the backdrop of the weird and supernatural. An incident in one season involving Mitchell, George, The Real Hustle and Marigolds comes to mind. Both men broken, unable to talk about it, completely lose it when their favourite show isn’t on when it’s supposed to be. Season one sees all of the characters grapple with their situation and grow into a close family. Herrick, the vampire leader in the area terrorises them, and ultimately is killed by George. George also accidentally turns his girlfriend Nina into a werewolf which is devastating for both parties. I know people have said they don’t like Nina, I’ve never gotten that. I have a feeling Nina is a harsher version of what Andrea Riseborough’s Annie might have become. The show needed some grounding. The trio also discover how Annie died, that it was murder on the part of her fiancé, a shocking revelation to both herself and the audience. Season two sees a group arrive who are performing tests and manipulations on the three types of supernatural being; the werewolf, vampire and ghost. Obviously, our trio end up in the centre of this, Mitchell being lured in and caught in the deception. Nina also tries to join a trial and is nearly killed. She is finding dealing with her wolf very difficult. She and George rekindle their romance which is wonderful to watch for the ‘realness’ of it in such an unreal situation. Mitchell, cajoled by Daisy and Ivan (two old vampires), looks to becoming the head of the vampires in Bristol after Herrick’s demise. He believes that he can teach them to stop drinking blood. This all goes horribly wrong. Mitchell falls off the wagon in the worst possible way... leading to the Box Tunnel Massacre. Mitchell and Daisy go on a killing frenzy, murdering 20 people on a train, which of course gets mentioned in the newspapers and is the centre of an investigation. It’s difficult for a main character to come back from something like that, like I said before, John Mitchell is dangerous, and he always seems like underneath all of his trying, there is a monster as much as there is a man. That’s the genius of him. Annie also gets tufted into purgatory. Nina, George and Mitchell flee to Barry Island in season three, after the events of season two and the box tunnel killings. All are determined to find Annie, and Mitchell goes looking for her in purgatory. He is taunted by Lia, a victim of the massacre, who is making Mitchell fulfil prophecies which will see he and George kill one another, or at least, George kill him for everything that he has done. Annie and Mitchell start a romantic relationship as best they can. Nina is pregnant and worried about what this will mean for her transformations and for the child ultimately. The group are living in an old bed and breakfast with a Hawaiian beach painted on the wall; Honolulu Heights. The drama is top quality, as is the humour. Coming upon Adam, a teenage boy turned vampire who has been feeding on his parents for years; the group try to set him up with a family of vampires... who turn out to be swingers. Seeing Nina and George debate whether to go back for him before showing up armed with pot plants and clubs is A grade Being Human humour. Adam gets his own spin off webisode series called Becoming Human, where he and a werewolf at his new school investigate the murder of a ghost that they have befriended. The end of season three does indeed see George killing Mitchell, at his request when he is going to be used as a weapon, and as best friends. It’s heartbreaking. The series ends with a shot of Nina, George and Annie, the new team so to speak, and it made me sad and excited at the same time. Unfortunately this grouping was never to be. At the beginning of season four we see that Nina has been bashed to death by a group of vampires, not long after giving birth to her and George’s baby girl; Eve. George is completely devastated. Annie is performing surrogate mother duties for Eve, and Tom McNair, a werewolf from season three, is back and helping out. One thing that was consistent throughout Being Human’s first four series was the calibre of the guest characters and their actors. Tom’s appearance in season three as a werewolf vampire hunter with his dad was gold. 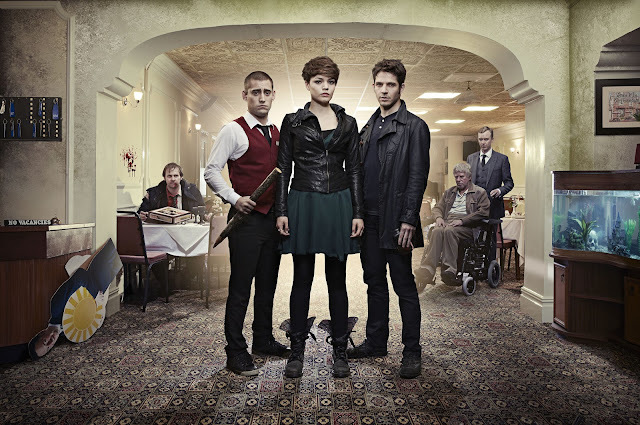 Michael Socha brought a different kind of innocence to the group, a different read on the wolf to George. Though he is reserved like George, he is keen to learn and more than a little sheltered. He’s also badass. He has the vampire slaying MOVES. Buffy would be proud. Vampires known as ‘The Old Ones’ want Eve as they believe she is the key to their survival and existence, that by killing her, the ‘saviour’ ,they can live forever. George dies in an attempt to save Eve, making Annie and Tom promise to protect her after he is gone. Annie invites Tom to stay at Honolulu Heights and they also adopt Hal, a vampire who has been clean for several years after living with his own trinity of werewolf, ghost and vampire. He has kept a routine that allows him to control his urges to feed and because his werewolf best friend Leo is dying, the ghost of the house will likely disappear with him as they were in love. Hal, as mentioned before is similar to Guy Flanagan’s Mitchell. A more mysterious and traditional vampire but with an obsessive compulsive twist. Together the new trio sets to living with their pain, with the constant new threat and with each other. I have to say, the premise of the saviour child was pretty flimsy. This was the first big plot arc where I found it difficult to engage. That aside Damien Maloney’s Hal and Michael Socha’s Tom are hysterical together. Their friendship isn’t a carbon copy of Mitchell and George’s, but it’s also definitely real and fun to watch develop. Working at a diner together, taking bets on talking to the ladies, it’s all going swimmingly well until Hal lands a date with a pretty girl over on holiday; Alex. Then the traditional vampire story comes back. 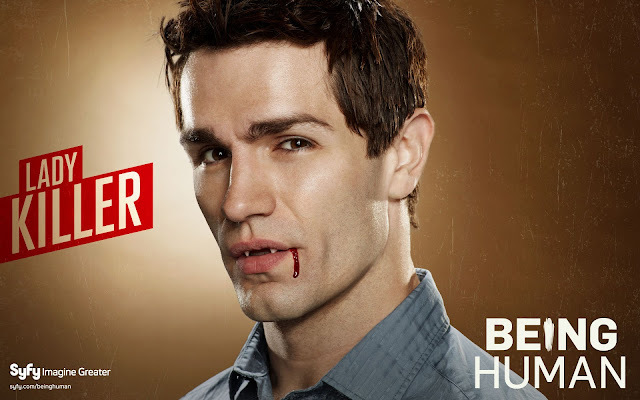 Hal, pushed gently by Nick Cutler, a vampire he created in his hay day (and a bloody good take on a modern and tech savvy vampire), starts the blood lust again, resulting in Alex’s death and new ghost status. We discover that Eve’s death as a baby is the key to stopping the vampires from enslaving humanity, and from Hal being their ruler. Annie blows up Cutler, The Old Ones and baby Eve to save everyone, and is reunited with George, Nina and Mitchell through the door into the afterlife, though we never see them. 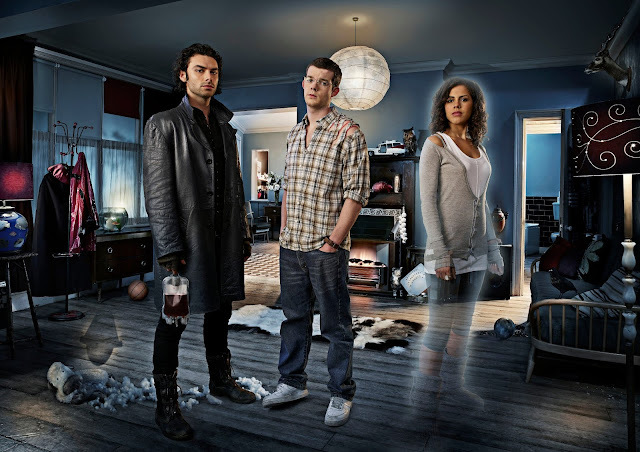 The series ends with Alex having moved into the house as the new ghost. If I was to pick the weakest season of Being Human, it would be season five. Not because of the lead characters though. As previously mentioned, Hal and Tom are amazingly good and Alex makes a wonderful new addition to the group. She suits Hal and Tom down to a tee, she’s incredibly funny and smart and I really began to love her as the show continued. Being Human is one of the few shows that successfully did a full cast turn over and provided equally loveable replacements, which were never treated as replacements, and the other characters never forgotten. Where season five was less strong was in the plot and the guest actors and characters. The plot revolves around the Devil rising. The Devil being the Big Bad is problematic. Not only is there nowhere to really go from that fight, there is also very little opportunity to do the story justice in six episodes. The season as a whole wasn’t quite as scary, though the heart remained, and as a result of the stakes, the character development didn’t take off as it normally does. Tom especially didn’t seem to grow quite as much as previously, we didn’t get as much of Alex’s history as we might have liked, Hal was the focus of the season, and we were revisiting the falling off the wagon plotline, which was getting old and creeping back into Mitchell territory, making all vampires seem to be the same. The guest characters were pretty average with two exceptions; Phil Davis as Satan/Captain Hatch and Kathryn Prescott of Skins fame as Natasha. Given the somewhat ridiculous nature of having Satan as the Big Bad, Phil Davis did an incredible job of making the evil one particularly heinous and chilling. He was disgusting, malicious and when he finally rose, had all the charm that one would imagine the master manipulator would have. Kathryn Prescott plays a survivor of a vampire attack as a child who has grown up loathing supernaturals. She falls for Tom which is completely adorable and meets a grizzly end as was necessary for the plot to continue. I would have loved to see more of her and Tom though. All of the others were not great. Steven Robinson’s Mr. Rook, leader of a group of people who clean up after supernatural leaks and lock up supernaturals, was never really sympathetic, real or interesting. The worst part of that was that he was key to the whole plot. Instrumental in unleashing the Devil on the world for this new round. Self obsessed enough with his organisation so as to never really get his point across and no one really cared about his plight. Indeed, in the end, there was nothing heroic about him, even when he seemingly performed heroic acts. He was a blight on the season unfortunately. As was Colin Hoult’s Crumb, a really pathetic office worker and generally uninteresting human being who was turned by Hal in an attempt to save his life after he’d been hit by a car. Crumb gets more pathetic and more obnoxious the longer he’s on the screen. Again, there is nothing to redeem him, he’s not funny, and he’s a bad stench that just won’t go away. Making things worse is his affection for Alex which ends up making him completely and maddeningly even more obnoxious. Even in his death there was no trauma or sympathy, there was only relief that maybe we could get on with a proper story now. This is a far cry from Nick Cutler in season four, Herrick in season one and three, Nina, given she was recurring to begin with, Romson Green as McNair in season three, Adam in season three. There are too many to name. In addition to these two terrible characters in Crumb and Rook, the others just never went anywhere, the hotel lady, the little dead boy, the other werewolf, the other vampire, that obnoxious guy who tries to teach Tom things yada yada, you see, nothing. Where season five got it right, was where Being Human has always got it right, in the interactions of the main characters and their struggle with humanity. In the little moments where they are a family and they are important to each other. Tom and Hal taking Alex to see her brothers, Tom getting lady advice from Alex, Hal trying to be a teacher and friend to Tom, the three of them hanging out and watching tv, working, falling asleep on each other’s shoulders, this is the good stuff. The trio attempt to bring the Devil down using an old ritual at the television station where he is preparing to send the world into mayhem and death after pointing out that we are so very good at doing it all by ourselves. Cut to each of our heroes being faced with a choice. A choice to go back and actually be human through a deal with Satan himself. Hal can die on the battlefield and never be turned into a vampire and so never kill all the people that he killed. Alex can be with her family, fall in love, live again. Tom can stay in Honolulu Heights with Allison, his girlfriend, and their child, no wolf. All three, after some heavy consideration, elect to go back to reality; Hal cites the main reason by saying “You should have put us all together” implying that none of this means anything without the friendship they share, another hallmark of Being Human. Rook takes out the Devil and all appears to have gone back to normal except that Alex and Tom have decided they need to kill Hal to stop him from killing again. What is interesting in Damien Maloney’s performance as Hal on the blood is that, even in saying that the Good Hal has completely left, his performance is similar enough to bring back the point of George’s character; that the monster or curse is just an extreme version of us, and to deny that is to deny our humanity. It’s a nice touch. As they are about to try to kill Hal, Rook shows up. It turns out that the Devil escaped into him and he’s back to kill them. The trio try to perform the ritual, knowing it will kill them all and they will be trapped with the Devil. Hal tells Rook that the Devil must possess a human, and that when he is repossessed Hal has to kill him. Rook agrees. As this happens there is a shift in energy. Alex, Hal and Tom wake up in the house on the floor and they are all human again. Hal hypothesises that because their afflictions came from the Devil, they disappeared when he was killed. Alex proceeds to eat everything she can get her hands on and change her clothes. The boys ask her to stay. Hal tells Alex that if she chooses to stay, she can also have him. The trio sit down on the couch in Honolulu Heights to watch television and drink tea. Hal muses that he told the Devil that the mistake he’d made was separating them. And look, here they all were. The screen cuts to the mantle piece where there are old trinkets and stakes kept, and a little origami wolf that the Devil placed on the same mantle in Tom’s dream... and a laugh. Perhaps they are actually in a dream land together, the Devil won and they are unaware but happy. I believe this is what the end means. The point is that, regardless, they are together, and really, that’s what Being Human the television series, and being human in general is about; companionship. In the end, Being Human is a solid show, if not in the department of answering canonical questions, then in the development of it’s characters. I never quite got the rules about how ghosts operated, when they could or could not be seen. Never got answers about the significance of the men with sticks and rope and why Annie was both loathed for not taking her door and disobeying and at the same time, destined to not have her proper door until she killed Eve. What was up with that? I never got why Alex’s door just never showed up. I mean, it seemed like that was going somewhere and it just kind of stopped; maybe due to cancellation? Where did all the vampire coven stories go? Surely they didn’t disappear. Where did all these weird agencies come from and how did they tie together? It just never all completely gelled. But the characters I got. The girl, frightened and unable to stick up for herself in life, being the ultimate heroine in death and saving the world. Making fantastic friends and keeping them human. Their companionship being important, their struggle to be as good as they could possibly be, which is what we are all striving for. The addict who kept doing terrible things but loved his friends. The man who was cursed and learned to deal with it, only to have everything taken away, including his love and his child. I got the man who couldn’t stop being what he was, the other living as an adolescent in his ‘fathers’ shadow. A father who made him the wolf. And I got the dead girl who thought she was going on a date and that she had a whole life to live seizing her death and ghost-hood as another chance and a different way of living. Those things Being Human did well until the end. Annie, George, Mitchell, Nina, the two of you. What none of you realised is that the desire to be human is to be it. To want it is to have it. So no, you’re not wasting your time Tom. You’ve already won. Goodbye George, Annie, Mitchell, Nina, Hal, Tom and Alex. Goodbye Being Human.